Research suggests that a good digestion system can keep you from getting sick and a bad one can be the cause of allergies and disease. Research and many supporters of Kefir say that it can bring your digestive system back to good health, making strengthening your immune system and boosting your resistance to allergens. Kefir is made from "grains" that do not look at all like a grain. 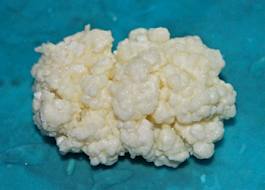 Kefir grains are small, soft, cauliflower-looking living organisms. They could be as small as the head of a pin or several inches across. When added to milk, kefir grains actually begin to change the milk. Kefir is a culture, in some ways like yogurt, but unlike yogurt, you do not sterilize and heat milk before adding kefir. Kefir grains digest bad bacteria and leave in their place good bacteria. After sitting in milk for 24 hours, kefir grains are strained out (and used again). The resulting drink is tart and effervescent. It is thicker than milk, but not as thick as yogurt. Kefir contains several major strains of friendly bacteria not commonly found in yogurt: Lactobacillus Caucasus, Leuconostoc, Acetobacter species, and Streptococcus species to name a few. It also contains beneficial yeasts, which help balance the intestinal flora and destroy pathogens even E-coli and parasites. These probiotic organisms help to clean out the intestine and actually mend weakened areas. These weakened areas are sometimes called "leaky gut." If you have leaky gut syndrome, partially digested food, toxins, and bacteria are able to escape into the blood system causing a reaction an allergic reaction. Probiotics or friendly bacteria can actually heal leaky gut syndrome. The friendly yeasts help with the destruction of harmful yeasts which contribute to leaky gut syndromes. Unlike yogurt, kefir actually helps colonize the intestinal tract, so it lives there and continues to create healthy bacteria, continually improving the digestive tract. Kefir is a popular drink, which is known as a miracle drink, for its immense health benefits. It is a drink which is prepared by fermenting milk with live kefir grains, which are a mass of large numbers of microorganisms and yeasts in a matrix of proteins, polysaccharides and lipids. Find out more information about kefir health benefits in this article. Kefir is the name of a drink, which is made by fermenting milk with kefir grains. This fermented milk drink was originated in the Caucasus region. The word, 'kefir', however, came from two Persian words, 'kef', which meas foam, and 'shir', which means milk. Kefir grains are used in the preparation of this fermented milk drink which contains a mixture of bacteria or microorganisms and yeasts, and polysaccharides, proteins and lipids. These grains closely resemble the shape of cauliflower, and are considered as an excellent source of beneficial bacteria or probiotics. Due to the numerous kefir health benefits, and its unique microbiology, this fermented milk drink is considered as a miracle drink. 1) Kefir has antibiotic and antifungal properties. It can prove helpful in conditions like, candidiasis (yeast infection), heart disease and HIV/ AIDS. 2) Kefir can provide us the beneficial microorganisms that can improve digestion, to alleviate some common digestive problems like gas, bloating, indigestion, etc. It can ensure regular bowel movement to cure constipation. The enzymes found in it can be especially beneficial for the people with lactose intolerance. 3) Apart from the beneficial microorganisms, kefir can provide many essential vitamins and minerals. It is a rich source of vitamin A, B2, B12, K and D. The most important minerals found in kefir are, calcium, phosphorus and magnesium. 4) Kefir can cleanse the colon and address any kind of intestinal problem. It can provide relief in inflammatory bowel disease as well. 5) Kefir can treat a number of health conditions like gastritis, pancreatitis, eczema, stomach ulcers, psoriasis, rheumatism, arthritis and gout, osteoporosis, anemia and leaky gut syndrome, to name a few. 6) Kefir has a stimulating effect on the immune system and hence, can improve its disease fighting capacity. 7) Kefir can reduce the risk for certain cancers including, colon cancer, by preventing the growth of cancerous cells. 8) Kefir can also calm the nerves of our body, to maintain a healthy nervous system. This property of kefir is due to the presence of the amino acid, 'tryptophan'. 8) Kefir has antioxidants and anti-aging properties. It can neutralize the free radicals, that damage the body cells and tissues by oxidizing them. By reducing the impact of free radical damage, kefir can slow down the aging process. 9) Apart from these, other kefir health benefits include curing or controlling acne, sleep disorders, depression, asthma, bronchitis, hypertension, diabetes, chronic fatigue syndrome, allergies, colitis, diarrhea, etc. Kefir is quite easily digestible, and can be taken by children as well. It is a complete source of protein, with so many essential amino acids. To sum up, kefir is a great food that can detoxify the body, and improve the functions of the different body systems to promote health and vigor. It can also help in losing weight. Considering all the kefir health benefits, it can be concluded that introducing kefir to our diet is an excellent idea to live a healthy life.